The Howling Dogs (al-‘awa’) is a grouping of either four or five stars that was said to resemble either the Arabic letter kaf in its medial form (ىكى) or the Arabic letter alif in its final form (ىا). For English readers, it could be said to look like a tilted capital L, or perhaps a less-than sign (<). The whole asterism takes 25-30 days to set, depending whether you count four or five Howling Dogs. Regardless of the number of its dogs, this asterism gets its name from the coldness of the weather when it rises just before sunrise, which causes dogs to howl in discomfort. It was also said that this star grouping marked the Haunches (warikan) of the Lion. 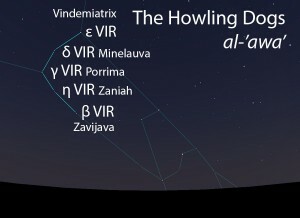 The Howling Dogs (al-‘awa’) as they appear in the west about 45 minutes before sunrise in early March. Sky simulations made with Stellarium. In the calendars of Qushayr and Qays, the morning setting of the Howling Dogs occurs during the warm spring rainy season (ad-dafa’i). In early listings of the lunar stations, the Howling Dogs is the 15th station of the year. This was later changed to the 13th lunar station after the stations were adjusted to begin with the vernal equinox. 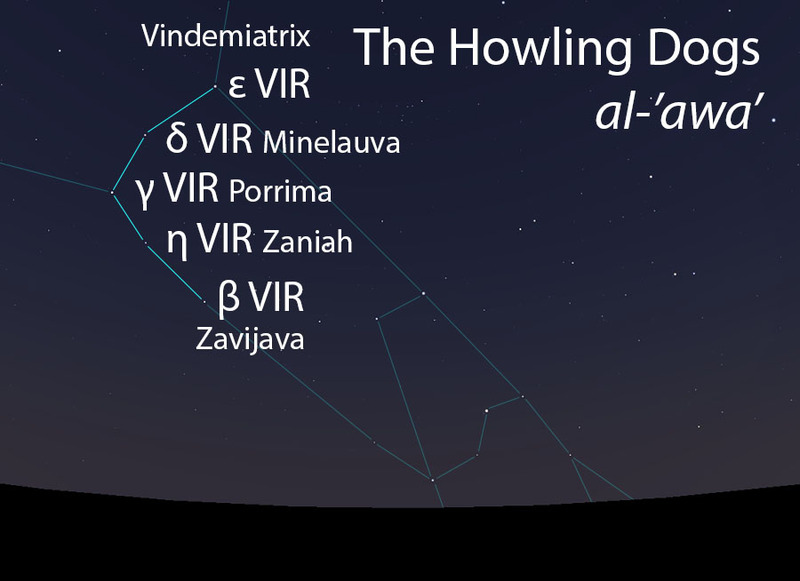 The stars that mark the Howling Dogs also represent the Two Haunches (al-warakan, الوركان) within the context of the Lion (al-asad, الأسد) folkloric celestial complex.